Sennheiser’s ‘functional’ top end (as in, excluding the “give me your Amex Black and repeat after me… help yourself!” Orpheus) was rebooted with the HD 800. This remains a stunning headphone that was launched with two tiny flaws; it was so detailed that it could seem a bit bright and it could get even brighter when partnered with the wrong amplifier. As Sennheiser at the time didn’t have a suitable DAC/amp partner to accompany the HD 800, the potential for brightness was a significant one. The HD 800 S is a response to that criticism and a mark of how much Sennheiser has learned even in the last few years. It retains the awesome detail and resolution of the HD 800, but without the sheer amount of upper end information to hand. 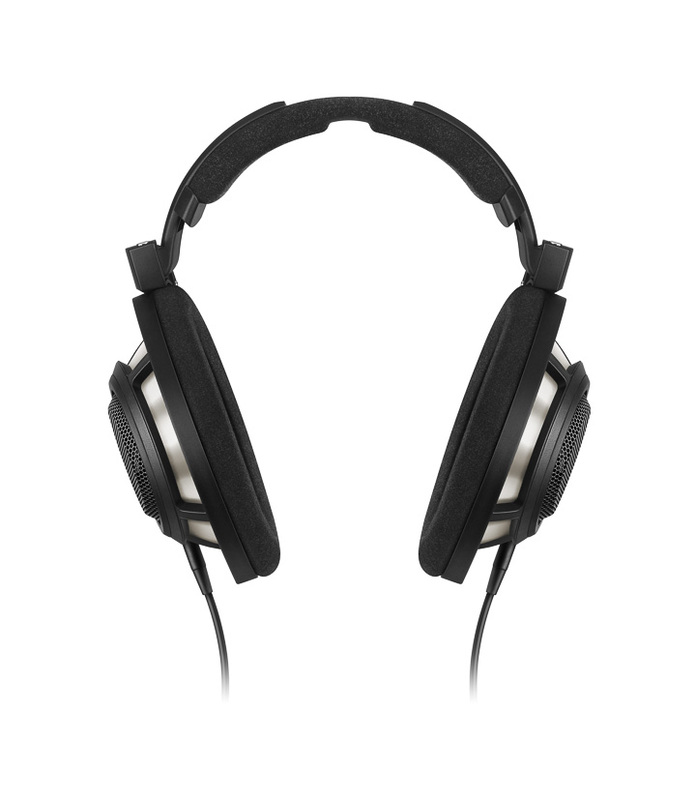 The HDV 820 addresses the other side of the issue, by providing what Sennheiser believes to be the optimum electronic partner for this and other headphones in the range. However, as the HDV 820 is somewhat ‘spendy’, it seems unlikely that it would be used with anything in the Sennheiser range below the HD 800 S, so in a very real way this is kind of Sennheiser’s top-end ‘package deal’ (Orpheus notwithstanding). The open-backed HD 800 S can be recognised as distinct from the original HD 800 by its more ‘tacticool’ appearance. It’s all stealth black and – it must be said – somewhat bolder looking than its silver/black older brother. It’s also a perfect match for the ‘none more black’ look of the HDV 820. In a very real way, the HD 800 S look and feel reflect the fact that Sennheiser faces one of the biggest challenges of all – staying relevant. It’s a company with a long history and a reputation for research-led design, in a market that is now incredibly fluid and filled with passionate newcomers with big ideas that can often shout down solid R&D. That makes a company as innovative as Sennheiser potentially seem like a part of a fusty ‘old guard’. Products like the HD 800 S quickly disabuse people of such thought-processes at the point of contact. Yes, Sennheiser is a mature brand and the HD 800 S reflects that maturity, but it does so in all the right ways; it’s not some reactionary paean to Sennheiser’s past glories, but a distillation of decades of development. The HD 800 S is not designed to be shiny bling, worn as a fashion accessory first and a music playing tool a distant second; it’s for those who appreciate the finer things in life – including excellent music – and don’t need to advertise their success in garish red plastic. That all being said, I think the look and feel HD 800 S are exceptionally refined, and intended for use in homes that people call ‘elegant’ and ‘sophisticated’. A lot of what goes into the HD 800 S was developed for the HD 800. In fact, Sennheiser isn’t saying a great deal about the changes between the two. The two share the same ring diaphragm and Helmholtz resonator design, and they both use the same connectors (now in black for the HD 800 S). The HD 800 S does come with two sets of cables – one set single-ended with a 1/4” headphone plug and the other with a four-pin XLR for balanced operation, but you could have easily bought a balanced cable for the HD 800. Aside from the black livery, you’d be hard pressed to see what had changed.